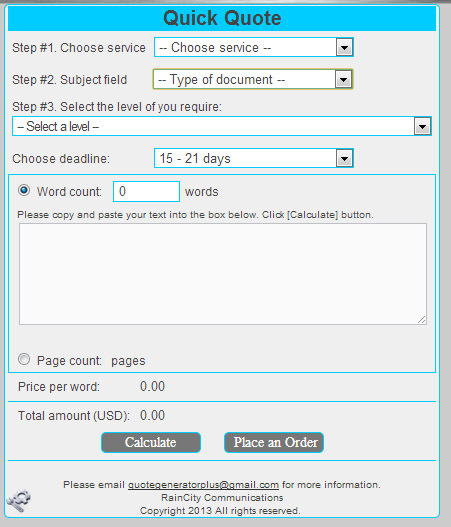 Quote generator helps Writing-Editing-Translating companies sell services faster and more accurately. Most companies have sales processes that are time consuming, complicated, and often produce inaccurate quotes. Quote generator makes your service and pricing more accessible to customers and helps you save time and increase your sales. With quote generator plus software you can create an interactive web page where your customer can selection options, ask questions electronically. You will get notified on all quote activity. Collect credit card payments from customers. We support PayPal. For only $199.99 we can provide you with a customized, online, instant writing-editing-translating services Quote Generator connected to your website. You can log in and change the contents of your quote page without having any technical knowledge. You can update it hourly, daily, or weekly; the choice is yours. 3. Try it free for 14 days. 4. Buy and Start using Quote Generator. Quote Generator Plus is local to the Greater Vancouver area Canada; however, our online presence makes us available to the entire business world.